← And now for something really scary ……. One of the more frequent guests on the Albert Mohler Radio Show is one of my contemporary hero’s, Dr. John MacArthur. MacArthur was in town (Louisville, Ky home of the radio show) to deliver the 2006 Mullins Lectures at the Southern Baptist Theological Seminary chapel this week. Mohler mentioned during the show that the messages could be heard online and that a link was created from his own web site. So I went to the site (SBTS: Fall 2006) because I am always looking for good messages to listen to. By the way if anyone reading this has not heard John MacArthur’s sermon “The Tale of Two Sons” on Luke 15, it can be heard at this site as well. This is very similar to the one he delivered at the 2006 Shepherd’s Conference. I love that sermon. Anyway, I listened to the first lecture this morning on the way to work. The subject MacArthur is teaching on is “Christ – The Head of the Church”. He began the lecture with a history lesson about those who had been martyred for proclaiming this truth of the headship of Christ over the church. I was fascinated by some of the stories of these brave, and uncompromising men. 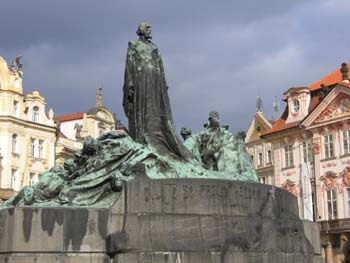 Men such as the German preacher John Huss (or Jan Hus). Huss preceded Luther by about 100 years and it is documented that Luther referred to Huss quite often in his writings and teachings. Huss was burned alive at the stake by the Roman Catholic church for writing and preaching in opposition to papal indulgences, and clerical abuses of power. This execution of Huss, whose name sounded like goose in German, coined the phrase “your goose is cooked”. I learned that in the days of Luther most of the people could not read, so many of Luther’s writings were done with illustrations. In these illustrations when he referred to Huss a goose would be drawn. There’s that Luther sense of humor coming out again. LOL! You can read more about the history of The Reformation at this interesting web site: A Puritans Mind . I know I am going to enjoy listening to these lectures if they are even half as good as this first one. There is just so much to learn and so little time this side of glory. Oh what a time it will be to have all of eternity to learn about such things, and to meet and speak with these hero’s of the truth as we worship together in the presence of our Lord.